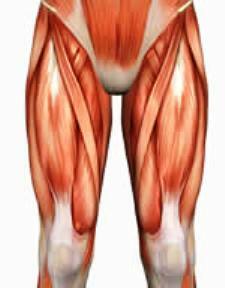 Quadriceps literally means 4 heads, and the quads are the large group of muscles that make up the front of the thigh. The quads are important for nearly every lower body movement, and work during walking, running, and jumping. Here's just a brief overview of the anatomy of the quads. The 4 parts of the quads are the vastus lateralis, vastus medials, vastus intermidius, and rectus refomirs. Vastus means large, and the three vastus muscles are named by their position. Lateralis is on the outside, intermedius is in the middle, and medialis is on the inside. If you are looking at someone with really lean thighs, you can only see 3 parts of the quads. The rectus femoris covers the vastus intermedius, so you can only see the rectus femoris, vastus lateralis, and vastus medialis. All 4 quads will straighten the knee. This motion is referred to as knee extension. The rectus femoris is a unique part of the quads, and it can assist in bending the hip (known as hip flexion). The quads will work during exercises like squats, leg press, lunges, step ups, leg extensions, and dead lifts. In running and jumping sports or activities, it is important to have strong quads. Strong quads support the knee and the entire lower body. But many people must make sure that they balance quad strength by also exercising the opposite muscle.. the hamstrings. The best leg exercises focus on multiple muscles at once. Learn some of the best multi-joint leg exercises.